Treat yourself to an unforgettable Grand Canyon experience with this helicopter flight from Las Vegas to the Grand Canyon's West Rim and skip-the-line admission to the amazing glass-bottomed Skywalk. 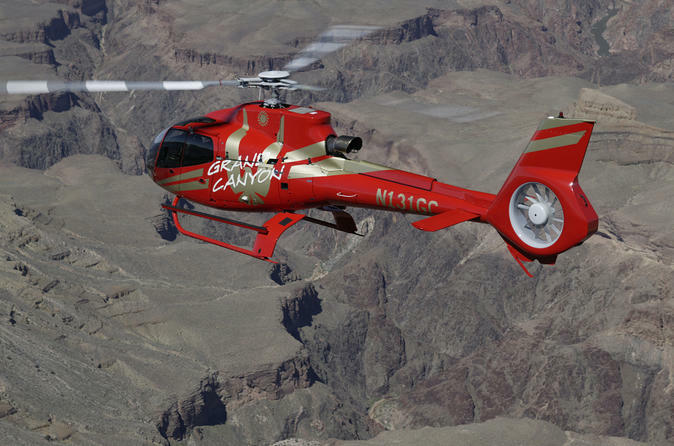 Admire captivating views of Arizona's Black Mountains, the Grapevine Mesa Joshua trees, massive Hoover Dam, Lake Mead and the colorful, marble-like walls of the West Rim during your helicopter ride. Bypass the crowds waiting to stroll onto the Skywalk's breathtaking glass walkway. This small-group tour is limited to six people for a more intimate experience. Your luxurious small-group trip to the Grand Canyon begins with morning pickup by limousine from your Las Vegas hotel. Board your comfortable, state-of-the-art helicopter and fly east toward the Grand Canyon, taking in views of Arizona's Black Mountains, the Grapevine Mesa Joshua trees, Hoover Dam, Lake Mead, extinct volcanoes and the Grand Canyon's magnificent West Rim. Listen to recorded narration about the sights you see and the tremendous geologic forces that created the Grand Canyon. Enjoy a light snack after your 45-minute flight and head right to the front of the line at the Skywalk, a horseshoe-shaped, glass-bottomed walkway suspended 4,000 feet (1,219 meters) above the floor of the Grand Canyon. Located on the Hualapai Indian Reservation, the walkway juts 70 feet (21 meters) out from the edge of the canyon and offers unparalleled views of the canyon walls and Colorado River far below. Receive a souvenir photo of your thrilling Skywalk experience. Reboard your helicopter for your return flight, which takes you over the Las Vegas Strip for some incredible photo opportunities. Your 5.5-hour Grand Canyon tour ends with limousine drop-off at your hotel.